I bet you thought you were finished hearing me go on about Bristol, right? Ha! How wrong you were. How many more wonders of Victorian engineering can I tell you about? How many soaring bridges? How many big, greasy gears? How many ground-breaking maritime propellor designs? None. That’s how many. No more Victorians. 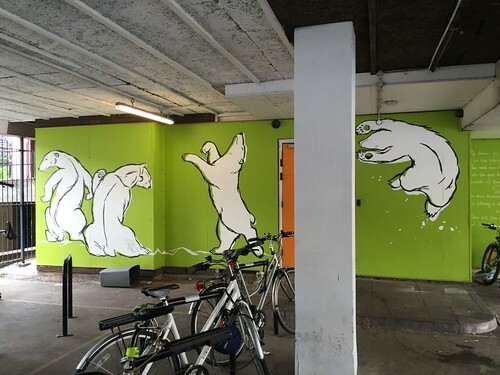 Today, we’re rocketing into the very modern world of street art. Is it art? Or is it vandalism? Read on. "Street Art?”, you say, "Isn’t that just an apologetic, politically correct term for good old fashioned graffiti?” Sort of, yes. Technically, street art is a subset of graffiti. Because technically, graffiti is "writing or drawings that have been scribbled, scratched, or painted illicitly on a wall or other surface”. (Thank you, once again, Wikipedia.) (And yes, I’m aware that technically, graffiti is plural and so that last sentence really should have been “graffiti ARE” not "graffiti IS” but that would make me sound like even more of an insufferable pedant than usual.) Opponents might sniffily dismiss street art as unwelcome and destructive, but fans would say it's public art, albeit usually (though not always) unsanctioned. And Astute Go Stay Work Play Readers will recall we’ve already seen some particularly charming examples of Paris street art from a much earlier Day Out. Probably Banksy’s most recognisable work, exhibiting his trademark black sprayed stencil, a pop of colour, and a memorable epigram. This one appeared on London’s South Bank in 2002. 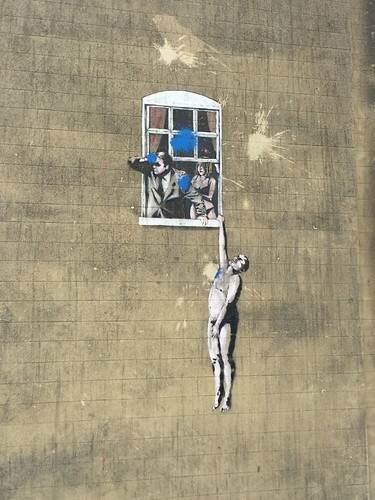 Banksy may be Bristol’s most famous street artist (by a long chalk) but he is certainly not the only one. 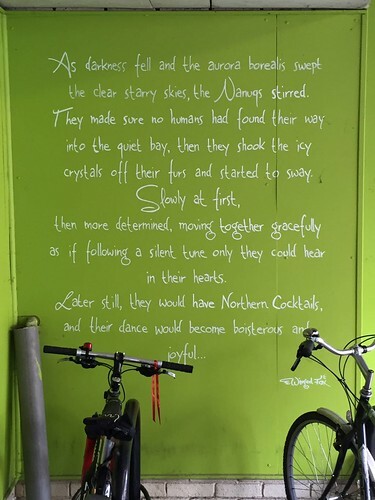 Which is why, after a Saturday full of Victorian boats and bridges, I decided to spend my Sunday morning on a guided tour of the ever-changing display of Bristol’s Street Art. The tour started at College Green in the city’s centre, which is also the city of Bristol City Hall. Our guide was herself an artist, and she started by talking a little about the scene in Bristol and about the nature of street art. 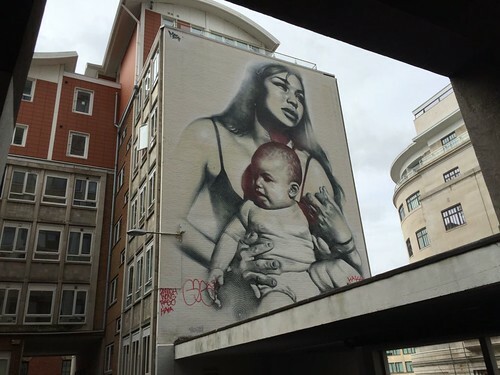 I guess it’s a particular challenge guiding this kind of tour because street art can be a highly transient medium. The guide admitted she’s constantly scouting and having to revise the tour route to take in new works and bypass old ones that have been painted over or tagged beyond recognition. Street art comes in many forms. Most people will immediately think of the colourful freehand spray painted murals that show up on walls and hoardings. Spray paint’s big advantage is that it’s fast and easy to transport. It also dries very quickly, which allows you to layer over it and build up complex work in a short amount of time, and that can be important if you’re working on the edge of legality. But freehand spraying is just one form of street art. At the bottom of the hierarchy is tagging, which I’d say doesn’t really constitute art at all. To give you an analogy, tagging is to street art as living statues are to opera. Or possibly as balloon folding is to the symphony. Tagging is that annoying signature-like thing that’s usually done simply with thick felt-tipped markers or spray paint. Taggers each have a particular design for their tags that they repeat over and over. A piece called “The Big Deal” by an artist called JPS. The sort of hand-shaped thing above it is a tag. And here’s a close-up of that artwork. Quite clever and Banksian. JPS started his career after a very rough past of substance abuse and homelessness. 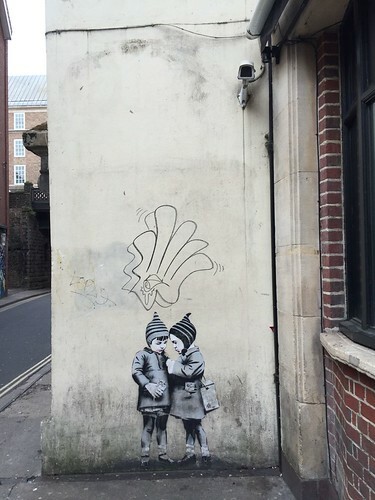 He saw the Banksy exhibition in Bristol in 2009 and it inspired him to turn his life around. 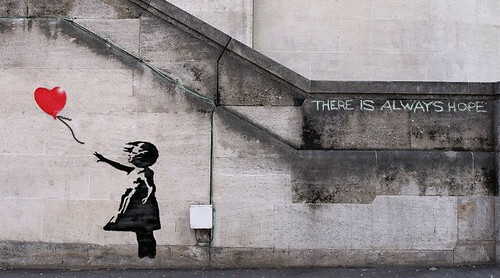 He’s now a respected street artist in his own right, and this piece is a tribute and thank you to Banksy. Note the CCTV camera above the two kids, clearly focused away from their deal. And also note that while the tagger made his mark, he didn’t actually deface JPS’s work. There tends to be a certain respect paid. This one is sometimes called “The Well Hung Man”. And the building was once a sexual health clinic. 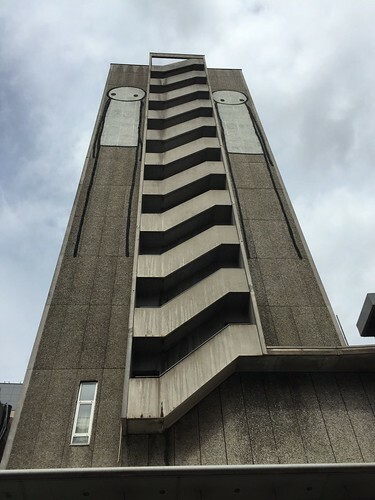 After the local council bought the building and considered removing the piece, 95% of Bristolians voted to keep it. Sadly, this hasn't stopped wankers from vandalising it with paintballs. Stencils have the advantage of allowing an artist to carefully plan a work in advance - some stencils are even laser cut which allows for great detail. And stencilling means a complex piece can be executed quite quickly on site. Some artists, though, go for the old faithful paint brush. It’s a much slower method, but allows for more precision than spraying (even with a stencil). Quickest of all, though, is a paste-up, which is precisely what it sounds like - a pre-printed piece of paper or set of papers that’s simply pasted onto the wall. More complex paste-ups can even be 3D, sort of like the Paris Space Invaders. 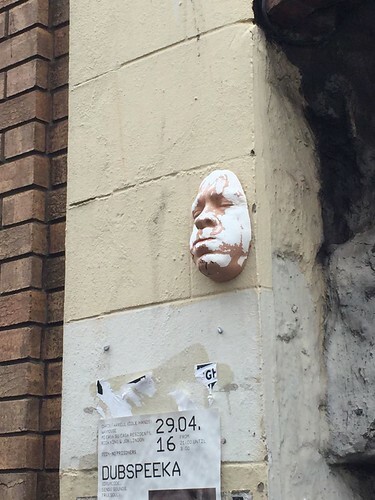 This guy does plaster casts of his own face and sticks them on the wall. Because everyone needs a hobby. Stik is a well-known London-based artist who only does these funny stick figures. 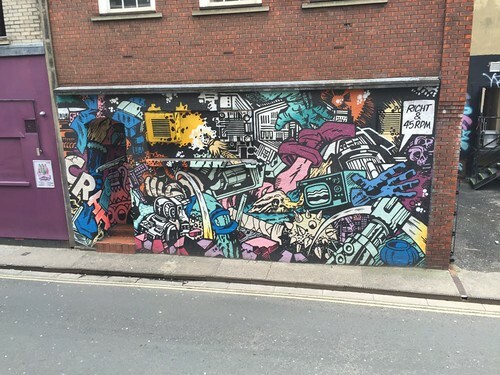 And once my eyes had been opened, I could see that Bristol is frankly blanketed in street art. Giant murals, tiny paste-ups, witty stencils, and endless tags. I was particularly taken with a clever sort of stencilling on an old and dirty stone council building. 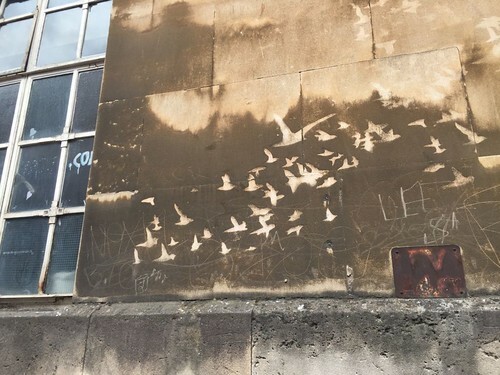 Rather than painting on top of the stone, the artist created a stencil and pressure-washed his design so that he was, technically, not actually applying anything to the wall. It’s reverse graffiti! And is it vandalism at all if you’re actually cleaning the wall? We finished our tour in the neighbourhood of Stokes Croft, which has a reputation for being a rough neighbourhood. But the building where we ended - Hamilton House - is clearly helping to turn that around. The building houses artists’ studios, festival offices, radio stations, film and music producers, alternative therapists, dance groups and social enterprises of all stripes. There’s also a café on the ground floor, and that’s where we saw the last works in the tour. Our guide has a studio in the building and she showed us a commissioned work she’d done that I found just lovely. Because this was a commission, and is located in a locked parking area, she had time to work and there’s much less chance of the work being tagged or painted over. A few local guys were sitting in the outdoor seating area of the café, one of them wearing a Dismaland hoodie. They bantered with us a bit, clearly aware of why we were there, and implying that one of them might be Banksy himself. But the whole exchange was tinged with a bitter note that made you think these guys must be very tired of their neighbourhood and community being on display for passing rubberneckers. This, coupled with the fact that the café didn’t really have any nice pastries, meant that once the tour ended I left quickly for a more welcoming spot. But not before appreciating this last giant mural. 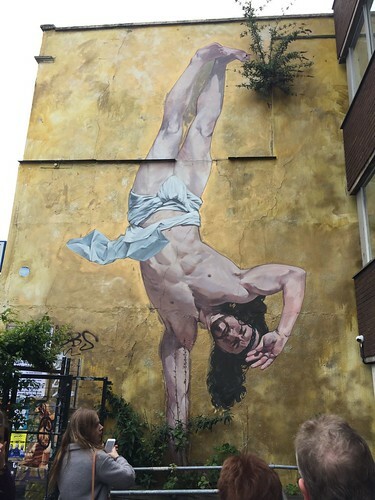 It’s a 28’ high break-dancing Jesus. And if that’s not a good way to end a blog, then I’m hanging up my keyboard right now. P.S. As usual, there are more photos at Flickr. 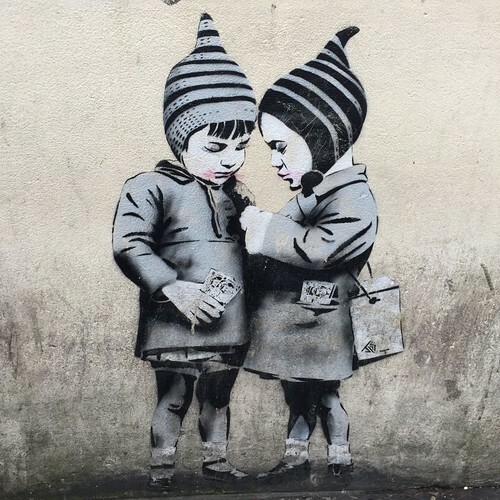 And even if you rarely bother to click over to my lovingly curated Flickr albums because you can’t stand to look at another set of gears, it’s worth doing so this time, because there’s just a load of fun street art stuff there in the Bristol Album. And also because I pay twenty quid a year to keep that Flickr account ticking over, so have a go. 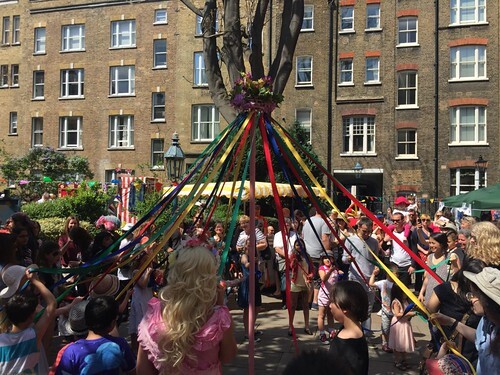 Back about a month ago, on a sunny Sunday afternoon before the show was all-consuming and I had a whole luxurious day of nothing in particular to do, I was reminded of a yearly event that’s been on my list to attend - the Covent Garden May Fayre. 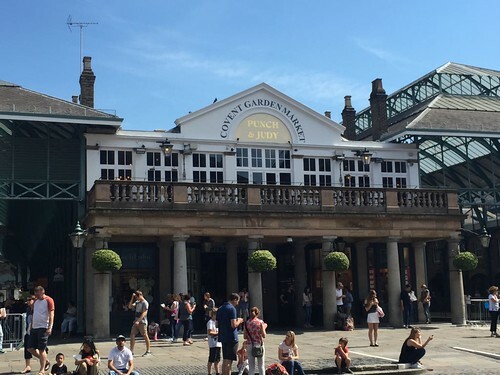 Covent Garden Market. There's a good reason why this lovely pub above the market has the name it has, as we shall soon see. I get reminded of these kind of things because I receive an email from TimeOut London that appears in my inbox each evening and lists half a dozen or so interesting things to see and do in London the next day. It’s an embarrassment of riches, and a constant reminder of what an astounding place this is to live. For instance, I’m writing this on a Bank Holiday Monday so my TimeOut email for the weekend covers three days worth of events and includes, among other things: a free documentary screening, a vintage fun fair, a “baby disco” for kids under five, a walking tour covering every street in St. James’, a gallery exhibition open until 10pm, a street food festival, a debate among leading female scientists on the latest discoveries in their fields, a pop-up Hungarian-themed bar, a chance to tour the entrance hall of Brunel’s Thames Tunnel, a Miami Vice themed party (in Hoxton, of course), an interactive “enchanted garden parade” (whatever that is), a poetry reading, a picnic (on a Bank Holiday! Folly!) and, of course, a one-night-only Game of Thrones themed comedy night at a pub. All of which is just to reiterate, again, how totally amazing it is to live in this city, even though right now I have no burning need to attend a Hungarian pop-up bar. 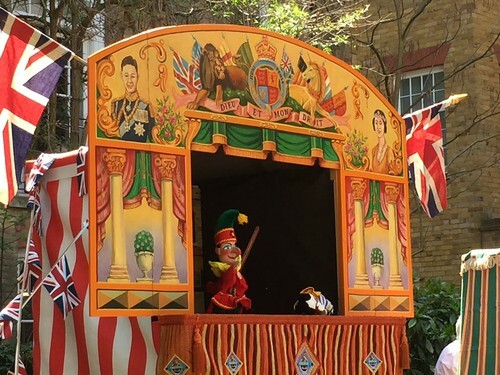 It was particularly nice to be reminded about the Covent Garden Fayre, because its main attraction is a large display of Punch & Judy shows, which is an odd and interesting bit of English culture that I think is perfect for Go Stay Work Play Live. Punch & Judy is a traditional form of puppet show featuring Mr. Punch (based on the Italian commedia dell'arte character Pulcinella) and his wife Judy, along with a small cast of other stock characters such as the Baby, the Constable, the Doctor, the Crocodile and, oddly, a string of sausages. 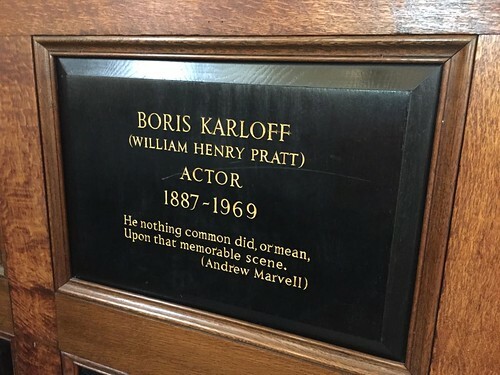 Using hand puppets, a single performer known as The Professor sets up in a small free-standing puppet theatre and performs all parts, switching deftly among puppets and voices while acting out a short series of sketches from what must be a very very well-worn playbook. Several Punch & Judy puppet theatres. There were no less than sixteen different booths set up for this year’s event. 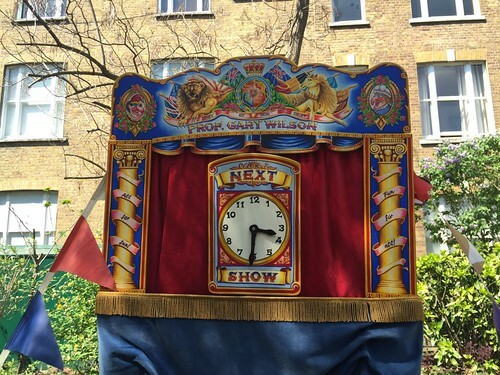 Punch & Judy shows have a remarkably long history. The first recorded mention of one is by the famous diarist and cheese-hoarder Samuel Pepys, who saw a show at Covent Garden on May 9, 1662 (hence the name of the pub). This means that though this was only the 41st Covent Garden May Fayre, it was celebrated as Mr. Punch’s 354th birthday. And note the olde worlde spelling of “fayre". I was going to be snide about this until I read about Pepys and realised that this is genuinely an olde worlde thing. The Fayre was set up in the churchyard of St. Paul’s, Covent Garden - not to be confused with the much much much much much much much more famous St. Paul’s Cathedral. The churchyard of St. Paul’s is a lovely tiny little patch of green that’s hidden from the tourist-choked hustle of the Covent Garden Market and yet only steps away, down a few different narrow and mostly unmarked alleyways. It’s a great place to get away if you tire of negotiating the endless living statues and selfie-sticks of the main market. 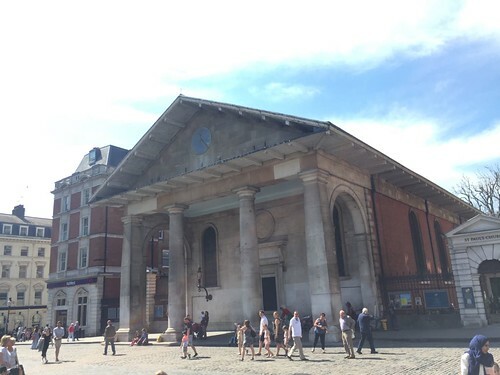 The church’s imposing main portico faces out onto the market square and is a favourite spot for buskers. And here’s the much friendlier hidden side of St. Paul’s, teeming with happy fayre-goers. 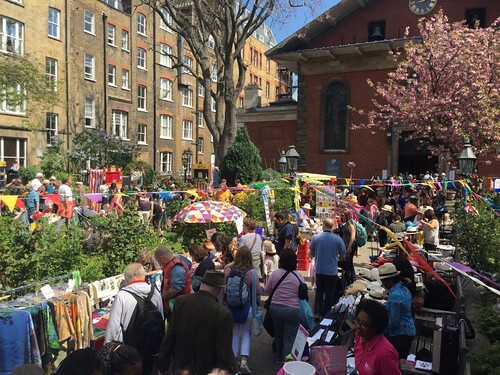 Because the churchyard is so small, it didn’t take a lot to fill it up with people, puppet theatres, food vendors, and stalls selling Punch-related items like vintage books, hand puppets and paper cutout puppet theatres, which gave things a properly festive atmosphere. I arrived too late to see what was billed as the “Grand Procession” (complete with brass band), so I contented myself with wandering around waiting for the next show to start. Each little puppet theatre had a sign like this. I guess it’s A Thing. Also A Thing? The red and white striped cloth that covers the bottom half of most booths. Punch & Judy shows are utterly saturated with tradition, as we shall see. As most people know, Punch & Judy shows are notorious for their violent slapstick storylines. The basic plots revolve around Mr. Punch being irresponsible and disobedient when left alone and then violently attacking whoever comes back to check on him with a large wooden club. Sometimes the responsible puppet - Judy or the Constable or the Doctor - will get a few whacks in as well, but eventually Punch triumphs over the forces of law and order. It’s very much a set storyline. Punch and his slapstick, having felled some poor puppet now sprawled on stage left (possibly so the Professor could prep another one on his left hand below). 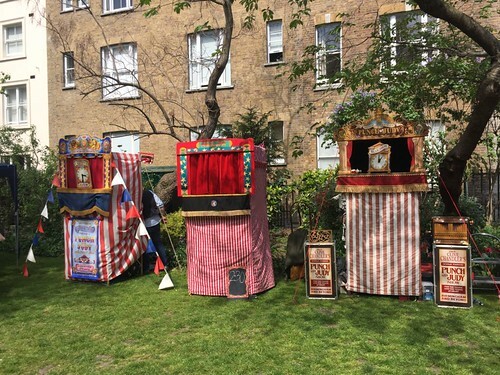 Punch & Judy shows started life as entertainment for adults, and the cast of characters often included Punch’s mistress, Pretty Polly, and the Hangman, Jack Ketch. And while the Devil still appears in modern shows, those saltier characters are now rare, and Punch & Judy shows have evolved into children’s entertainment often seen at kids parties and associated with traditional English seaside culture. As might be expected, the Covent Garden May Fayre was very much a family event. Lots of parents with kids were there, and I’m pleased to report that even in the 21st century, Punch retains much of his politically incorrect soul. The most basic plot line (and I use the term “plot” loosely) involves Judy leaving Punch in charge of the Baby (Aside: amusing comment from Judy about the Baby: “We called him Bill because he came at the end of the month”). In earlier days Punch would beat the baby with his bat. These days he usually just sits on the kid, because, naturally, he is “babysitting”. The audience is often exhorted to snitch on Mr. Punch when the responsible puppet is called away, yet despite loud shouts from onlookers, somehow they never return in time to catch him in the act. Eventually, though, all is discovered and the Constable is called, with mayhem ensuing. Punch’s stick gets traded back and forth, and makes a satisfying thwacking noise on various hard puppet heads. Often the amount of thwacking necessitates calling the Doctor, who will also inevitably get knocked about a bit as well. And at some point a string of sausages - inexplicably called "squashages" - will appear for supper. Despite their previous experience, the sausage owners will leave the food in the care of Mr. Punch, with strict instructions not to dangle them out the window. Of course it doesn’t take a PhD in dramaturgy to deduce what happens next. Though I was actually a bit surprised when Punch got his comeuppance from, of all things, a passing crocodile, who snatched the sausages away in his pleasingly slapstick-like jaws. All in all, though, it’s not exactly “King Lear”. Nevertheless, it was clear the crowd enjoyed the show, in that sort of way you enjoy seeing something you remember from childhood carried on for your own kids. And there was food and ice cream and bright sunlight and opportunities for children to pester their parents to buy them stuff and have little fits when they didn’t. And just to prove that they could not be more English without actually colonising a nearby designer shoe shop, there was, naturally, maypole dancing. I stayed to watch enough different versions of shows to understand that there was nothing more to understand, and then, unsurprisingly, went for coffee. And as I walked I tucked away my thoughts on the day for some future blog post, which, happily, is now complete. P.S. As usual, though I tend to forget to mention it, there are more photos at my venerable Flickr account.